Sephora does some really great value kits throughout the year but the customizable Sephora Favorites sets take the cake for me. I love that you can pick and choose according to your personal needs and it's usually a great way to try out pricey products in small sizes before committing to the full size. Today I wanted to break down the value of the Sephora Favorites Customizable Skin Care and Hair Gift Set, which is still available on the site. For $25, you get to choose five from 13 skin care and hair care options plus a rose gold travel pouch. None of the hair care products jumped out at me so I went with five skin care items. The products are deluxe sample sizes so you can use most of them more than once, besides the sheet mask options. I wish Sephora would note how big each of the samples are since it is hard to tell from the tiny stock photos - that's why I thought I'd share the breakdown of the samples I chose. The combined value of the products, based on their retail prices and how much is in each sample, is really great. I didn't include the value of the travel bag but it's well-made and Sephora-branded so you could probably price it between $5-$10. I was especially impressed by the size of the Coola sample since I've seen smaller Coola samples before. I hope these products will be great for my skin as we head into the drier, cooler months - and if not, I only spent $25 to try them out. Did you pick up any of the recent Sephora Favorites kits? 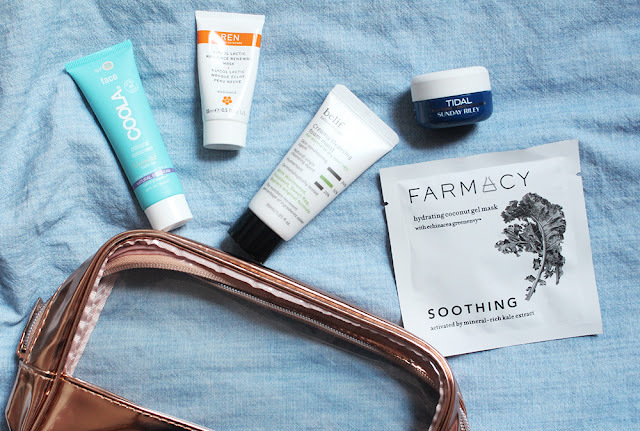 Let me know if you've tried any of these skincare products before!